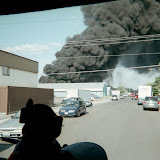 NARRATIVE: Today, February 16, 2007, the Spokane Fire Department responded at approximately 4:07 PM to 2613 West Gardner. The first crew on-scene reported smoke and fire showing at the upper floor of a 1-1/2-story, wood framed apartment building. Fire fighters aggressively attacked the fire from the front of the structure while additional fire crews completed search and rescue, roof ventilation and salvage and overhaul. The fire was brought under control within 30 minutes and there were no reported injuries to the occupants or firefighters. Eight fire companies with 26 firefighters responded to this fire and were on scene for approximately 2.5 hours. Four adults and one child were displaced by the fire and are being assisted by the Spokane Chapter of the American Red Cross. The Spokane Fire Department would like to take this opportunity to state the importance of installing properly working smoke detectors through out your home. The occupants of the apartment on the upper floor did not have smoke detectors and narrowly escaped the fire by climbing out a second floor window. PROBABLE CAUSE: The cause of the fire is under investigation by Fire Investigator Doug Dodson. DAMAGE EXTENT: Fire damage was confined to the upper floor apartment with smoke damage through out the rest of the structure. The Firefighter Stairclimb in Seattle is on March 4th. SFD members will be climbing 69 floors in full bunker gear "on air." This event is a fundraiser to benefit the Leukemia and Lymphoma Society. If you would like to be a sponsor, or donate, click on the link above or visit www.active.com/donate/ff07/spokanefire.